jquery-1.3.2.min.js is not a 'text file': it contains a line exceeding 8000 bytes. Use a different type manager (such as compressed file). Type manager "text_file_delta" failed create_version operation. Changed type of element "jquery-1.3.2.min.js" to "compressed_file". Afterwards, the file can be checked in without problems. Occasionally I have to deal with large graphs for some recursive automatons in the context of a dynamic programming algorithm. My automaton class is able to return a dot-style representation which describes the finite automaton, and it turns out that ZGRViewer excels in handling such large graphs by providing smooth zooming and easy navigation in the visualized graph. I found that because of the use of SVG it is much less memory consuming than, say, converting it to PNG bitmap graphics. 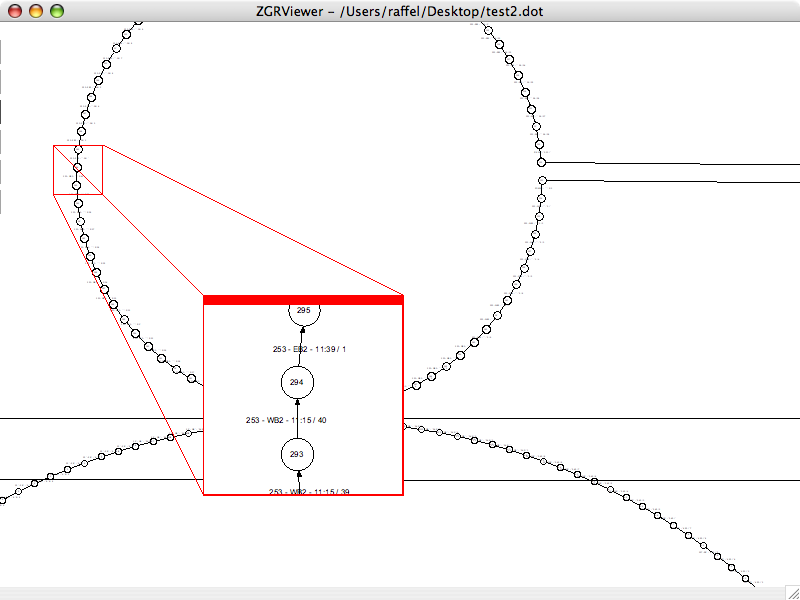 Here is a screenshot of ZGRViewer showing my DOT file opened with neato. Visit the ZGRViewer homepage for more screenshots and videos.